One of the urgent needs that Most Reverend Bishop Charles J. O’Reilly perceived in the Diocese of Lincoln was to establish additional parishes. While he was aware that new parishes were necessary, he also was aware that there were no diocesan priests available to staff them. The Irish Capuchins had previously responded to Bishop O’Reilly for priests in Oregon, so he decided to ask them to come to Lincoln. On January 4, 1919, the Diocesan Consultors approved the Bishop’s proposal to invite the Irish Capuchins to staff the proposed parish in Northeast Lincoln. Bishop O’Reilly received a favorable response and was given authorization to give the new parish to the Capuchin Fathers on April 29, 1919. Bishop O’Reilly closed the deal for purchasing the site for the new parish on May 15, 1919. The first location was at 25th and Y Streets and was comprised of seven city lots with two houses costing $14,250. One of the houses was used as a rectory. Two months later on July 13, 1919, an announcement was made at St. Mary Cathedral. A meeting was called by Bishop O’Reilly to make arrangements for the forming of a new parish. The meeting was held in the office of the DeWitt Grain Company, also known as Partington’s Trading Post, at 27th and X Streets. With an official decree dated July 15, 1919, Sacred Heart Parish was established at 25th and Y Streets, Lincoln. The parish was placed under the care of the Franciscan Capuchin Fathers of the Irish Province. When negotiations were completed, Fr. Casimir Butler, O.F.M. Cap. celebrated the first Holy Mass of Sacred Heart for the 67 charter members of the parish on September 14, 1919. The Holy Mass was held in the rectory. Later that year, the Provincial Chapter in Dublin appointed Fr. Edward Walsh, O.F.M. Cap. as pastor and superior of Sacred Heart, with Fr. Ferdinand Glenny, O.F.M. Cap. as assistant. On October 13, 1919 under the supervision of Fr. Walsh, construction of the hall, built on cement blocks, began on two of the lots. On Christmas Day in 1919, the first Holy Mass was offered in the new building. In 1922, Fr. Walsh was succeeded by Fr. Adrian Sharkey, O.F.M. Cap. Under Fr. Sharkey, the Altar Society and BVM Sodality were formed. In the summer of 1925, Fr. Raphael Quinn, O.F.M. Cap. succeeded Fr. Sharkey as superior of the parish. In the fall of 1926, Fr. Quinn and his assistant moved to the Friary at the new location. On August 21, 1927, the cornerstone was blessed by Rt. Rev. Msgr. P.L. O’Loughlin and was laid for the new combination church, school, and parish hall. This building is presently used as the main school and parish hall. The cost of the building was approximately $43,000. The new auditorium-gymnasium was opened November 25, 1927 with a bazaar and entertainment. The dedication of the church and school took place on Sunday, December 18, 1927 with the Most. Rev. Bishop Francis J. Beckman officiating. Fr. Quinn was re-elected the superior of the parish in 1928. That fall Sacred Heart Catholic School was opened under the direction of the Sisters of Charity of the Blessed Virgin Mary. At this time, two more priests were added. The assistants to the pastor now included Frs. Conleth Killian, Damien Ginnell, and Donatus Ahem. One of the priests was assigned to the missions of Greenwood and Ashland. The other priests were occupied on missions and supply work. Later, at the request of Bishop L.B. Kucera, the priests exchanged the mission work at Greenwood and Ashland for the chaplaincies of the State Penitentiary, Reformatory for Men, and the State Hospital. The school choir furnished music at these institutions for Christmas and Easter for several years. The Third Order of St. Francis was established in the parish in 1927 under the direction of Fr. Conleth Killian. A number of receptions and professions in this Lay Franciscan Order took place during the administration of the Capuchins. During the early years of the parish, financial assistance was given by the Order’s house in Abbotstow, Pennsylvania to the amount of $4,600. When the parish was well established, these contributions ceased. In 1927, the property was deeded to a newly formed corporation know as the Franciscan Order for the Roman Catholic Diocese of Lincoln, enabling the Capuchins to borrow money for the building erected and for payment of the balance of the new property. A loan of $32,500 was procured from the Lincoln Trust Co. Three notes totaling $18,000 were given to the Central National Bank for money barrowed. These were taken over by First National Bank when the banks consolidated. A building fund was established in October of 1926, to which parishioners subscribed each year, and this, together with proceeds from parish entertainment and bazaars as well as other donations and legacies, made up the fund from which interest, principal, insurance, and paving taxes were met. The balance of the Y Street property was sold at auction in the spring of 1929, part of it having been sold in 1927, and the proceeds deposited into the building fund. In the summer of 1931, Fr. Quinn was appointed for a third term as superior of the parish. The following three years Sacred Heart faced a financial depression with many heads of families out of work for long periods. The First Trust Co., trustee for the Lincoln Trust Co., extended the principal payments on the loan. Interest of indebtedness was paid in full during this time. In 1934, Fr. Quinn obtained consent of the bond-holders to reduce interest rate from 5 1/2% to 4% owing do to financial conditions. The First National Bank also reduced the rate on the notes from 6% to 4%. On January 8, 1933, the Friary was destroyed by fire, in which Adam Sassenberger, the aged caretaker, lost his life in the blaze and Fr. Quinn was severely burned. A new home had to be secured for the priests. The corner property west of the old Friary was purchased and remodeled. Assistant priests at this time were Frs. Conleth Killian, Beniguns, and Reginald O’Hanlon. Insurance from the fire loss and the work of unemployed parishioners took care of the purchase and remodeling expenses. The old Friary lot was divided into part playground space and the balance was landscaped. At the Provincial Chapter in the summer of 1934, Fr. Terrence Anglin, O.F.M. Cap. was appointed superior of the parish to succeed Fr. Quinn who had served the parish for nine years. That fall the school enrollment was the largest since the school’s opening with 136 students. It was a testimony to the parish growth. 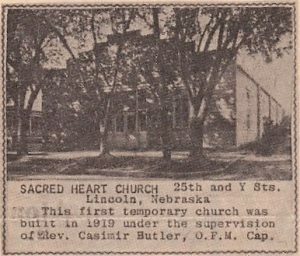 Early in 1937, the Bishop had articles of amendment filed, officially changing the name of the parish to Sacred Heart Parish of Lincoln, Nebraska. Fr. Anglin was assisted during his term by Frs. Benignus Brennan, Donatus Ahern, and Ephrem O’Sullivan. In September of 1937, the Very Reverend Stephen Murtaugh, O.F.M. Cap., superior of the Capuchin houses in the United States, visited here and brought the information to Bishop L.B. Kucera that at a meeting of the Order’s General Chapter in Dublin, Ireland early in the summer, the decision was made to leave the Lincoln parish. It was explained that their Lincoln house was far from their other houses located principally on the West Coast and therefore did not fit into the plan of a Province. Aside from this, the priests were needed for building and staffing friaries and for foreign mission work in Africa and India. After 18 years of service to Sacred Heart Parish, the Capuchins withdrew and diocesan priests took charge. Reverend Thomas M. Kealy was then appointed pastor of the parish. During his administration, a refinancing program was initiated and the parish buildings were repaired and improved. Fr. Kealy was in charge until the spring of 1938 when he was appointed diocesan director of the pilgrimage to the International Eucharistic Congress held early that summer in Budapest, Hungary. Reverend George J. Schuster, newly ordained, was in charge of the parish during Fr. Kealy’s absence. In September of 1938, Fr. Kealy went to Washington D.C. to attend the Catholic University to study Canon Law, and Fr. Schuster remained in charge. During these years, junior and senior units of the CYO were formed in connection with the sodality, Study Clubs were started for fall and spring sessions, a Boy Scouts troop was organized and the PTA became an active unit. In 1939, Fr. Schuster had the parish debt re-financed with bondholders being paid 50% as settlement, a new loan of $25,000 being made by Keenan and Clary of Minneapolis and again payments of the debt resumed. In September of 1939, Fr. Schuster was given the opportunity to attend the Catholic University of America, and Reverend Howard B. Hart, pastor at Superior, Nebraska, was appointed as the new pastor. He was installed on Sunday, August 29, 1939 by the Retired Reverend A.M. Mosler, Vicar General of the diocese. From the year 1939 to 1944, the 25th jubilee of the parish, $10,000 was paid on the parish debt reducing it to $15,000. The special Crusade Campaign in 1941, to which the people subscribed generously, together with bazaars and debt fund donations were responsible for this great reduction in the parish debt. During this period, Fr. Hart made many renovations and repairs on the parish property. Among these were the entire redecoration of the interiors of the church, school, hall, and Sisters’ Convent. In 1943, the first floor of the rectory was remodeled. The parishioners donated much of their own time and labor to bring about these improvements. On July 3, 1946, Bishop L.B. Kucera assigned Fr. Kenneth Schnoebeien as the first assistant to the Pastor, since the growth of the parish made it necessary to have four Sunday Masses. In the fall of the same year, the Novena to Our Sorrowful Mother was opened and the Reverend Clarence Brissette, O.S.M. came from the National Shrine in Chicago to install the stations. In 1948 chiefly through the donated time and labor of the men of the parish, four corn cribs were transformed into a one-story building across the street from the combination church and school. A two-way communication system between the rectory and the two school buildings was installed. The one-story building was first used as the parish Junior High School. Later it served as either 3rd and 4tht or 2nd and 4th grade classrooms. In 1966, the 4th grade moved to the main building. The one-story building was remodeled inside and made into a one room building housing 2nd grade. Two houses and a lot were purchases east of the convent for future use. Later, one of the houses was moved across S Street in order to make playground space available. This house was then used as the convent. In the spring of 1949, a new basement was dug north of the rectory and in July, the rectory was moved to this site to make room for the future new church. The building fund was increased by an annual bazaar. The bazaar held in 1948 was the most successful netting almost $7,000. 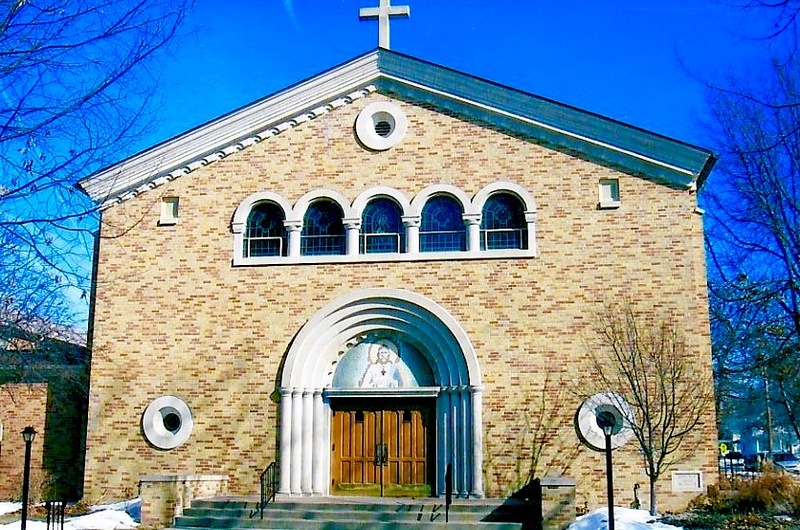 On May 26, 1949, the parish celebrated its 30th anniversary and the 15th anniversary of Fr. Hart’s ordination. On July 1, 1949, Fr. Schoebelen was transferred to Bellwood and Fr. Patrick Lyons was made the new assistant. A building committee was formed to make plans for the new church to be built on the northeast corner of 31st and S Street. Mr. Martin Aitken, who was engaged as the architect, met with the committee and it was decided to postpone building until a more opportune time, but a campaign for pledges was begun. Fr. Lyons was transferred to Blue Hill and Fr. Edward Szczech from St. Ceceila’s in Hastings was appointed assistant on September 17, 1950. Fr. Szczech re-organized the adult choir soon after beginning his assignment. Block Rosaries were formed in the parish in the fall of 1950 with each group meeting once a week to recite the rosary for Peace and the conversion of Russia. Improvements were made to the school building. Some of the school classrooms were remodeled in the summers of 1951 and 1953. Ground breaking ceremonies for the new church were held on July 7, 1953 followed by Benediction. The general contract was awarded to Westcott and Bowen and work commenced soon after. On January 10, 1954, the cornerstone of the new Sacred Heart Church was laid with Most Reverend Bishop L.B. Kucera officiating. The debt at this time amounted to $100,000 and the cost of the completed church was estimated to be about $215,000. On December 22, 1954, the new church was dedicated by the Most Reverend Bishop L.B. Kucera. Fr. Hart was invested in the robes of Domestic Prelate with the title of Retired Reverend Monsignor on May 10, 1955 by Most Reverend Bishop Kucera. John N. Buechel, a parishioner, received the title of Knight of St. Gregory at the same time. In 1956, Fr. Edward Szczech was appointed pastor of St. Wenceslaus Church in Wilber and Fr. Leander Ketter was made assistant to Sacred Heart Church. The adult choir grew and flourished under the guidance of Fr. Ketter, appearing on KOLN-TV and singing Easter and Christmas pageants. Fr. Ketter remained at Sacred Heart until 1959, when he was appointed pastor of St. James Church in Cortland, NE. The newly ordained Fr. Raymond Roh was appointed to take his place in May. Fr. Roh stimulated the athletics program at Sacred Heart Catholic School. In 1959, Sacred Heart parish lost about 100 families to St. John’s Catholic Church, a new parish established north and each of Sacred Heart. Since Sacred Heart was the mother parish, it was necessary that Sacred Heart contribute $25,000 towards the new parish. The rectory was moved north and east to 3144 T Street to make room for the new convent which would soon to be erected. In 1960, the great Diocesan Campaign occurred to gather funds for new buildings throughout the diocese. Pius X High School was built at this time. Fr. Roh taught at Pius X after its completion. In 1962, Fr. Roh was replaced by Fr. Paul J. Rutten, who, in addition to his parish duties, taught at Sacred Heart Catholic School and Pius X High School. The present Sacred Heart Convent, a beautiful sandstone brick matching the church and school buildings, was erected north of the church at 530 North 31st Street, and was completed on January 6, 1961. March of 1963 saw the establishment of the Justithe system of contributing, and soon after, construction on the new rectory was started. The new rectory was completed in March of 1964. Reverend Ronald Patterson, a member of the parish, was ordained on March 20, 1964 in Sacred Heart Church by the Most Reverend James V. Casey. He said his first Mass here on the following Sunday, March 22. Fr. Rutten was replaced in 1965 by Fr. William Kalin who taught at both Sacred Heart Catholic School and Pius X High School during his stay. Monsignor Hart began Perpetual Adoration in the parish in May of 1967. Fr. Kalin was assigned to the South American Missions in Venezuela in August of 1963 at his own request. Fr. Gerald Vap, formally of the Cathedral of the Risen Christ Parish, was appointed to take his place. Fr. Vap renovated the athletic program at Sacred Heart Catholic School. He taught at Sacred Heart Catholic School in addition to his regular duties. The housekeeper for the rectory was Miss Ella Dolnicek. She took on these duties in March of 1965. Miss Alice Dumpert was the housekeeper of the convent and had been at Sacred Heart since August of 1966. The Head Organist for Sacred Heart Church was Miss Marie Hassel, a graduate of the University of Nebraska. The children’s choir was directed by Sr. Mary Fitzgibbons. On November 24, 1968. the parish celebrated the 40th anniversary of the Sisters of Charity, BVM of Dubuque, Iowa at Sacred Heart Catholic School. During this 40 year period, 56 Sisters gave Sacred Heart Catholic School children a fine secular education as well as making Christ more meaningful to them, their families, and others. Under their guidance, the school’s enrollment increased from 115 students in 1929 to 376 students at its peak in 1958. Rt. Rev. Howard B. Hart continued to serve Sacred Heart Parish until June 18, 1970. His successors are Frs. Raymond Hain 1970 – 1974, Frank Machovec 1971 – 1980, Dale Hardes, O.M.I. 1980 – 1982, Ronald E. Patterson 1982 – 1998, Steven P. Major 1998 – 2000, Thomas R. Walsh 2000 – 2010, Mike Moran 2010 – 2015, and Leo Kosch 2015 to present. During their time at Sacred Heart, Frs. Ronald E Patterson, Steven P. Major, and Thomas R. Walsh, each was able to arrange for the purchase of one of three remaining private homes on the church block. With the purchase and demolition of the last house in October of 2000, the parish and school have a larger, safer playground with the possibility of expansion. Fr. Major had plans drawn up, which are under serious consideration to renovate and add on to the existing school, and to build a combination parish hall/school gymnasium. Bishop Fabian W. Bruskewitz, on the Feast Day of the Sacred Heart of Jesus, June 30, 2000, celebrated Mass and rededicated the church’s statue of the Sacred Heart. Parishioner John Nevole had arranged for the statue to be restored. The statues of the Blessed Virgin Mary, St. Joseph, and St. Anne were also restored at other times. The Bishop took the occasion to install Fr. Walsh as pastor and exhorted him to be a pastor after the Sacred Heart of Jesus. On the Feast Day of the Holy Name of Mary, September 12, 2001, five Brothers of the Servants Minor of St. Francis from Scranton, Pennsylvania moved into the parish Convent. The Convent was vacated when the Sisters of Charity of the Blessed Virgin Mary left as teachers for the school in 1999. The Brothers reached out to the poor and youth of the parish. Some of them pursued studies for the priesthood of Our Lady of Guadalupe Seminary near Denton. In the fall of 2001, the parish began the daily recitation of the Liturgy of the Hours. During Lent of 2002, the parish had a good participation in its Disciples in Missions Program. The program was scheduled to continue during Lent in 2003 and 2004. The parish continues to have Eucharistic Adoration, Fridays through Monday, with Benediction on the First Friday of the month. Sacred Heart Parish since its beginning has been outstanding for its number of converts. There have been hundreds baptized into the church over the years by priests of Sacred Heart and convert classes are held regularly. Aside from Sacred Heart Catholic School and the CCD and RCIA programs, the parish organizations include the Parish Council and Finance Council, the Building Committee, the Altar Society, the Holy Name Society, Prayer Chain, Godteens, St. Vincent de Paul Society, Knights of Columbus, Quilters, Cleaning Committees, Fellowship Group, and Senior Coffee. Additional information about these organizations can be found here. Sacred Heart continues to play a huge part in the lives of many within the parish, school families, and community. Source: Gosen, L. (Comp.). “Sacred Heart, Lincoln.” History of the Catholic Church in the Diocese of Lincoln, Nebraska, 1887 – 1987, Volume I, Pp 267-269. Lincoln, NE: Catholic Bishop of Lincoln. Source: Maney, Kathryn. “Sacred Heart Parish and School.” The History of the Diocese of Lincoln, 1987 – 2002, Volume II, Pp 80. Lincoln, NE: Catholic Bishop of Lincoln. Source: Gosen, L. “A Profile of the Diocese of Lincoln.” Southern Nebraska Register [Lincoln, NE] 4 February 1983. Page 2. Print.